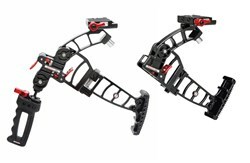 Zacuto releases Marauder & Enforcer as part of a new Foldable DSLR Rig line. The moment I unfolded it, put my camera on and pushed it against my shoulder I knew there was no way I could use any other rig for my DSLR," says Director/DP/Filmmaker, Philip Bloom. Zacuto has two new DSLR rigs on the market and ready to ship! These DSLR rigs are foldable, compact and small enough to fit into a back pocket. The Enforcer and Marauder are first of its kind; foldable DSLR run’n’gun stability rigs that are compatible with any DSLR or midsized camera. Both of these rigs are small enough to fold up and place in a back pocket or cargo shorts but when unfolded creates a stable camera support. These new rigs are very similar to two popular Zacuto DSLR kits, the Target Shooter and Striker. While the Target Shooter and Striker rigs are made up of various parts and rods that can be reconfigured into new setups, the Enforcer and Marauder unfold instantly and are ready to shoot. "The Marauder is quite possibly the most gorgeous and practical DSLR rig I have ever seen,” says Philip Bloom, Director/DP/Filmmaker. "The moment I unfolded it, put my camera on and pushed it against my shoulder I knew there was no way I could use any other rig for my DSLR." The Marauder rig, the larger of the two, includes both a gunstock and an adjustable handgrip to create a small stable structure. The Marauder includes a Zacuto Gorilla Plate V2 as the platform for the camera. The camera attaches to the plate with the single ¼ 20 screw and can also quick release on and off the Marauder with the red quick release ratcheting lever. The Gorilla Plate can be attached at two different points; in a vertical position for use with a Zacuto Z-Finder, DSLR optical viewfinder, or extended via the red push lever to place the camera further away for use without a Z-Finder. The difference between the Marauder and the Enforcer is that the Enforcer only includes a gunstock with a comfortable rubber pad. To adjust the gunstock to different body shapes and sizes, just adjust the position of the gunstock with the two Allen screws and it’s ready to use. To check out these new kits, visit the Zacuto store or contact a local authorized Zacuto reseller. ZACUTO, located in Chicago, Illinois, is known for their "Made in the USA" brand of high quality, originally designed camera accessories. Zacuto Films produces original programming with EMMY’s won in 2010, 2011, and 2012 (Midwest region) or follow @Zacuto on Twitter. 888-294-3456.